w/ special guests Sweater Curse & Butternut Sweetheart. Please do not buy from Viagogo or other resale websites. We cannot guarantee the authenticity of these tickets or that you’ll be allowed into our shows with them. The only legitimate links are those on our official websites and Facebook pages. 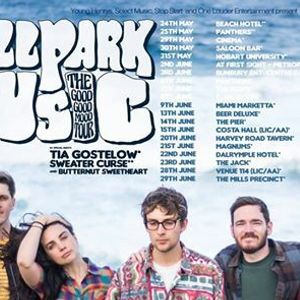 Ball Park Music are pleased to announce that they will take their hit record GOOD MOOD to regional towns and cities across Australia. The Good Good Mood Tour will boast an extensive twenty-one date run and take the band to cities they’ve never played before. 2018 was another benchmark year for Brisbane’s melancholic-pop masters. Their fifth album GOOD MOOD became their fourth consecutive ARIA Top 10 debut and was voted the #1 album by triple j listeners in the station’s 2018 Album Poll. 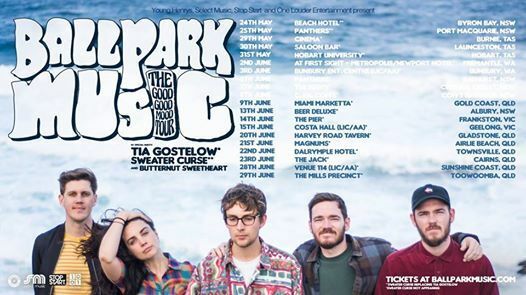 They closed out the year by embarking on their biggest tour to date - playing some of the largest venues of their career including Brisbane’s Riverstage, Fremantle Arts Centre and selling out Thebarton Theatre, Adelaide, Big Top, Sydney, and Festival Hall, Melbourne. The band opened 2019 on another high after their anthem ‘The Perfect Life Does Not Exist’ entered triple j’s Hottest 100 countdown at #39. This takes the band’s all-time tally to a whopping nine song entries. Frontman Sam Cromack says about the tour: "for years we've been wanting to do another extensive regional tour in Australia. It's not always the easiest or most practical journey for bands to reach out beyond the metro areas, but for us it's hugely important to take our music to every nook and cranny of this big hot island. Absolutely buzzing for some long drives, idyllic swims, weird over-sized monuments and cooked hecklers. Bring it on! ".